PALM BEACH, Fla. – March 16, 2017 – Barrett-Jackson, The World’s Greatest Collector Car Auctions®, will bring a docket full of coveted, rare Chevrolets to its 15th Annual Palm Beach Auction, South Florida’s premier automotive lifestyle event, April 6-8, 2017, at the South Florida Fairgrounds. Among Barrett-Jackson’s docket of featured Chevrolets is a ’67 Corvette 427/400 horsepower convertible (Lot #717) that is one of 16 painted in Greenwood Green over black vinyl interior. “Chevrolet has fueled our love affair for high-performance driving with sports cars like the Corvette and muscle cars such as the Camaro, and we’re proud that many of these iconic Chevy vehicles will cross our auction block in Palm Beach,” said Craig Jackson, chairman and CEO of Barrett-Jackson. “The number of man-hours and dollars invested in the restoration of some these Chevrolets is simply incredible,” added Steve Davis, president of Barrett-Jackson. Lot #717 is a rare ’67 Corvette 427/400 horsepower convertible with real factory side-pipes, one of only 16 made in that desirable combination. Finished in Goodwood Green over a black vinyl interior, this original matching-numbers car is equipped with factory air conditioning, automatic transmission, power steering, power brakes, power windows, tilt wheel, speed warning indicator and tinted glass. Since 1977 the car had two frame-off restorations and has been awarded the NCRS Top Flight, Bloomington Gold, Chevy Vette Fest Concourse Gold and the coveted Triple Diamond award. One of America’s most celebrated muscle cars, an authentic ’69 Chevrolet COPO Camaro (Lot #709) on the Palm Beach docket cranks out 425 horsepower with its L72 V8 engine mated to a 4-speed manual transmission. Painted in classic Hugger Orange with Ivory interior, this fully restored COPO Camaro features matching-numbers engine and correct date-coded drivetrain, and comes with the original Protect-O-Plate, installment sales contract, Roger Budd Chevrolet envelope package and 1969 pre-delivery inspection sheet. No expense was spared during the nut-and-bolt rotisserie build of a ’60 Chevrolet El Camino Pickup (Lot #700). The result of thousands of man-hours of work, the exterior body is laser-straight and finished out in Mist Opal Green Metallic and Desert Silver Metallic paint. Custom interior features include a suede headliner, deluxe carpeting, Mercedes-Benz bucket seats, door panels, waterfall console, Classic Instruments gauges, Ididit tilt steering column, Billet Specialties steering wheel, air conditioning, power driver’s seat, power windows, power vent windows and custom sound system. Under the hood is a highly detailed engine compartment that is home to a GM ZZ 502ci engine with a Ram Jet fuel-injection system coupled to a Richmond 6-speed transmission, with an aluminum driveshaft and Ford Fab 9″ rear end. 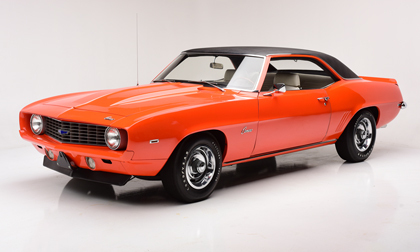 Other Chevy-powered vehicles crossing the Palm Beach Auction block include Lot #699, a ’69 Camaro Z/28 that has been inspected by Jerry MacNeish and certified by Camaro Hi-Performance as a real factory-built Z/28. Also crossing the block is a ’55 Chevy Nomad Custom Wagon (Lot #685) that features and over-the-top restoration. Finished in spectacular mile-deep Orange Pearl paint, this custom Nomad is powered by a polished fuel-injected LS1 power plant and features a full leather custom interior with European tweed carpeting. The 15th Annual Barrett-Jackson Palm Beach Auction will be broadcast on Discovery, Velocity and Velocity Canada during the three-day auction. For specific television schedules, please click here.For more information on becoming a bidder, follow the link to https://www.Barrett-Jackson.com/Bidder/Home. To consign a vehicle for the 2017 Palm Beach Auction, click here.